Nestled between swaying coconut and areca nut tress was a large two story art deco styled mansion with red Mangalore tiled sloped ceiling on an attic that ran through the house. There were some 20 odd smooth black granite steps leading down to the narrow canal flowing right next to the house with crystal clear water coming right up to your knees. The clear water on summer days in this canal with smooth black and grey pebbles would turn roaring muddy red and orange with white foams when monsoon rains unleashed from the sky, and at night it looked like a black serpent moving swiftly and hissing rather loudly breaking the songs of the crickets and the silence of the night! The interior of the house was rather simple when compared with the size and grandeur of exterior! Rectangle and squared shaped rooms were well lit and ventilated by large windows dotting two or three walls as the house faced the eastern sun. The smooth round window grills had wooden shutters which remained opened for most part of the day and night, except on hot summer afternoons to ward off the bright sunrays and heat. The red oxide floor was cool to touch and the slowly rotating ceiling fans hanging from dark wooden beams circulated humid warm air. The wide corridor running around the house had narrow high seats to sit on and gaze at the very large front garden where fresh deep orange and red areca nuts along with previous year's dried old ones were spread to dry out under the clear blue sky and hot blazing sun. At the end of the garden was a large vegetable patch where the vegetables were grown all year round. There were organically grown yard long beans, Malabar spinach, pumpkin, ash gourd and cucumber vines growing next to the rows of okra, tomato, potato and many other vegetables. There was a large patch of fresh fenugreek leaves and coriander leaves along with fresh ginger, mango ginger and turmeric which were used in every day cooking. At the other end of the garden were this rather large well from which the most sweet, cold, pure and clear water was drawn every morning for drinking and cooking. Further down the garden lead into ‘thoTa’ or farm with small and large bush of curry plants, huge jackfruit and bread fruit plants and rows after rows of fruit trees like chikku, pears, water apples, star apples, star fruits, custard apples, guava, limes, lemons and of course many varieties of mango trees in all sizes and shapes! The sweetest and juiciest fruits from these trees were shared with family and friends through out the year as well as the precious spices like pepper corns, cinnamon, nutmeg, mace and cardamoms that grew in abundance! That, my friends, is my Ajji/Grandma’s place where most part of my summer and Dussera holidays were spent with my siblings and dozens of my cousins. It was and is every child’s dream holiday destination with nature on your doorstep! Our days were not planned or we had any routine set. It was more spontaneous and we did what we felt at that moment. Someday we had back to back activities from morning till night and some other days we just relaxed lazing around. We swam in the canal next to the house, trekked around the hills in the estate, collected areca nuts with the farm workers and earned our daily wage to spend it on the sweet ‘goLi’ soda and peppermints sold at the small and only shop just outside the estate. We climbed the trees and plucked sweet fruits and harvested the vegetables for the day’s meal, fed the cows and watched our aunts and grandma milking them and drank the frothy full fat raw milk which tasted like nectar from the brass pot! We churned the butter by hands and spread it on a hot soLey and Akki Rotti and ate to our heart’s content. We walked to mango groves to collect the juiciest mangoes and ate them while their juice dripped down all over our arms. We climbed the terrace with some stolen raw mangoes or tender cucumbers and dipped them in a salt and chilli mixture with some coconut oil and ate till our stomach felt funny while the elders took siesta! We read books lying on a cool red oxide floor or under the mango trees, or sat under the cool shades of the terrace or corridors and travelled to a land of fairies, monsters or mythical lands! We swam in the knee high waters of canal, basked our wet selves under the sun sitting on the large rock only to jump back again in the canal to play for hours or until we heard the very loud voice of eldest uncle shouting us to get out of it before we catch pneumonia and end up spending all of our summer bedridden! We dragged ourselves half heartedly from the canal but only to have more fun in the large bathroom splashing water at each other and screaming at top of our voice! 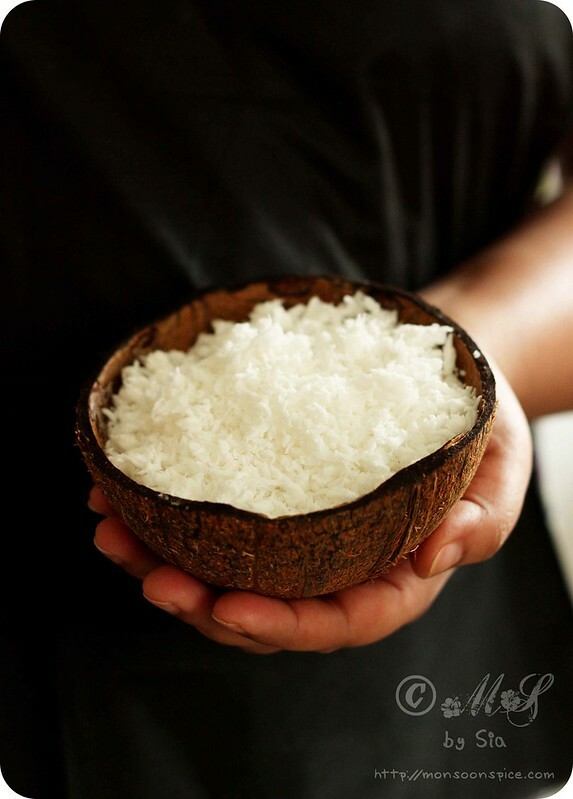 We ate delicious food cooked by our grandma and aunts spread on a long banana leaves sitting crossed legged in a row on a wooden plank or very long marble dining table which could accommodate twenty plus people at time! We left home to wander around the estate breathing in fresh and pure air and eating different wild berries that we collected on the way! We visited the farm workers houses and ate the food they lovingly offered while playing with their kids or holding their babies and wondering at the perfection of new life! We raided our aunt’s wardrobe and dressed up in colourful sarees. We prepared a skit and enacted them in front of our whole family. We drove to the small villages with uncles and begged them to buy us colourful ice candies sold by a candy man on bicycles without giving a toss about hygiene. We visited temples and village festivals and watched the temple priest carrying the idol on his head which weighed more than him in tonnes in awe! We watched the village celebrations and enjoyed dressing up and be a part of celebrations. And then there was food! Not pretend food or food made using wild leaves and berries. But real, edible food! We ate most of our snacks in our house and on some days our lunch was relished sitting cosily inside our house. Sometimes we sneaked inside the kitchen and brought our food to eat in our own house! Some days it was idli, rotti or dosa with chutney or sambar, and some other days it was sweet puddings, mithai and desserts. Some days it was plain Rosematta Ganji with pickle or chutney and some other days it was bowls of fruits drizzled with the forest honey. Sometimes the whole container was deep fried snacks were emptied and other times we made our own concoction of fresh fruit juices. It was fun…a whole lot of fun which I remember vividly even today! I won’t be exaggerating if I said I had the best childhood; colourful, vibrant, happy, safe and memorable one! 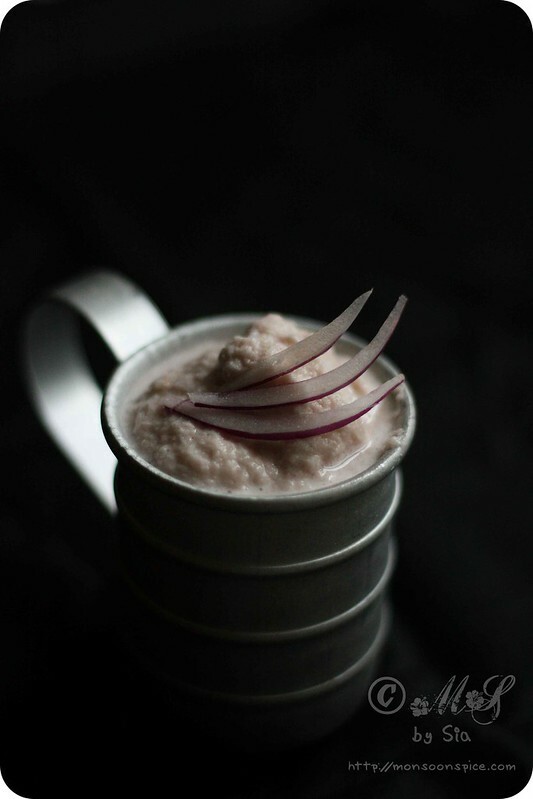 Onion-Coconut Chutney ~ Less is more! Every time I prepare the Onion-Coconut Chutney, I remember my childhood days in my Ajji’s place. 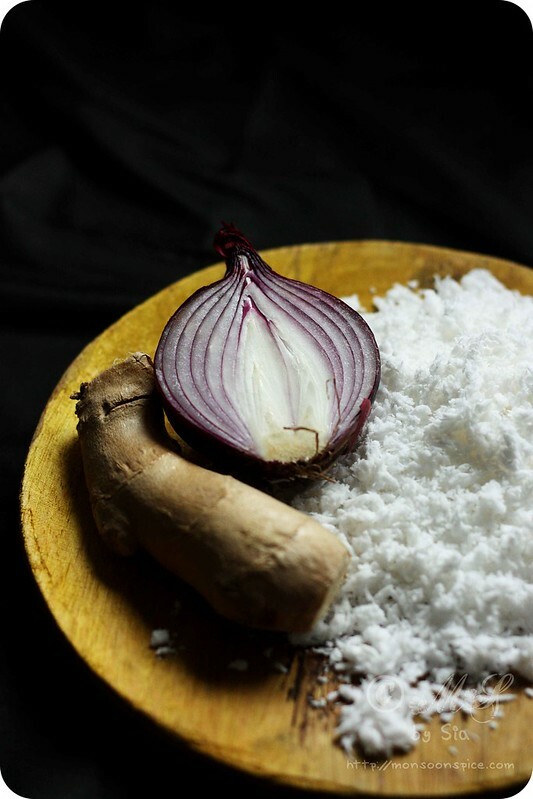 This Onion-Coconut Chutney was one chutney loved by every one of us and made at least 2-3 times a week. My maternal side of the family, my Ajji and aunts, made rather thin version of chutney somewhat the consistency of thin Samabr or cream of tomato soup compared to the thick coconut chutneys made in my paternal side of family. And I also remember my Ajji always adding tadka/tempering of mustard seeds and curry leaves in a coconut oil which made this chutney taste more delicious. 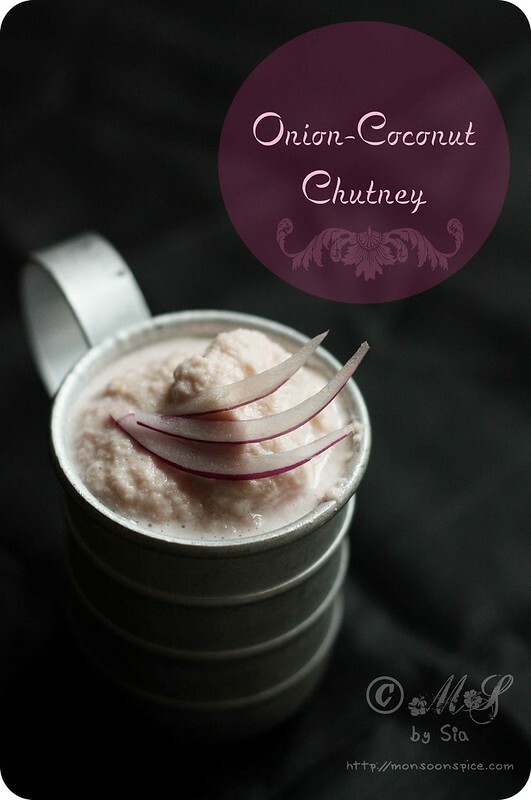 The sweet taste of red onions or pink shallots with creamy and sweet freshly grated coconut blends perfectly with a hint of sourness from tamarind and heat from ginger. You can add few green chillies or lightly fried red chillies to notch up the heat if you rather prefer spicy chutney. 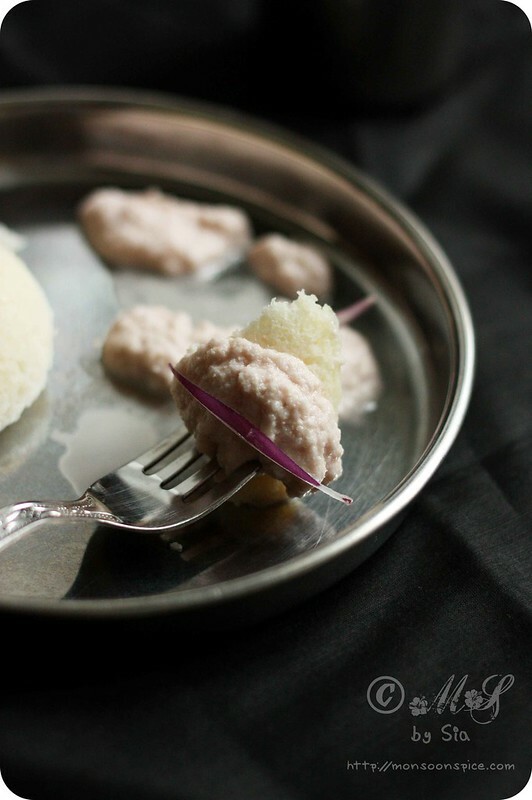 Served with Idli, Dosa, Rotti or even with a plain rice or Ganji (Rosematta Kanji/Ganji/Konjee), this creamy Onion-Coconut Chutney makes a wonderful condiment that is sure to tingle your taste buds. 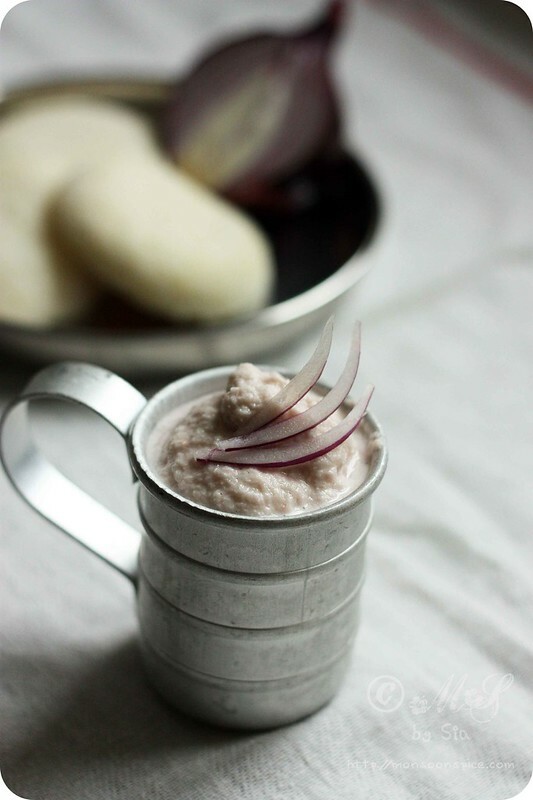 Sometimes the best food we taste is the simple ones and this Onion-Coconut Chutney is sure the best thing in my life as it has so many fond memories attached to it! Put all the ingredients in a mixer grinder or food processor and add about ¼ cup of warm water. Grind the ingredients for a minute. Remove the lid and scrape the chutney on the sides for uniform consistency. Add about ¼ cup of water (less or more depending on the desired consistency) and grind for another minute or two to get smooth paste. 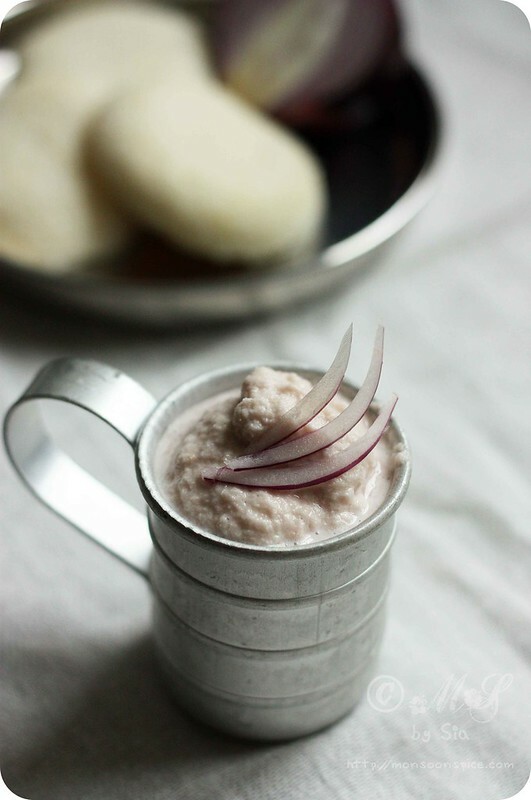 Adjust the seasoning and serve this Onion-Coconut Chutney fresh with any Idli, Dosa or with plain rice. Enjoy! You can make it either thin or thick depending of your desired consistency. My grandma also added tadka of mustard seeds and curry leaves in coconut oil which made this chutney taste even more delicious. 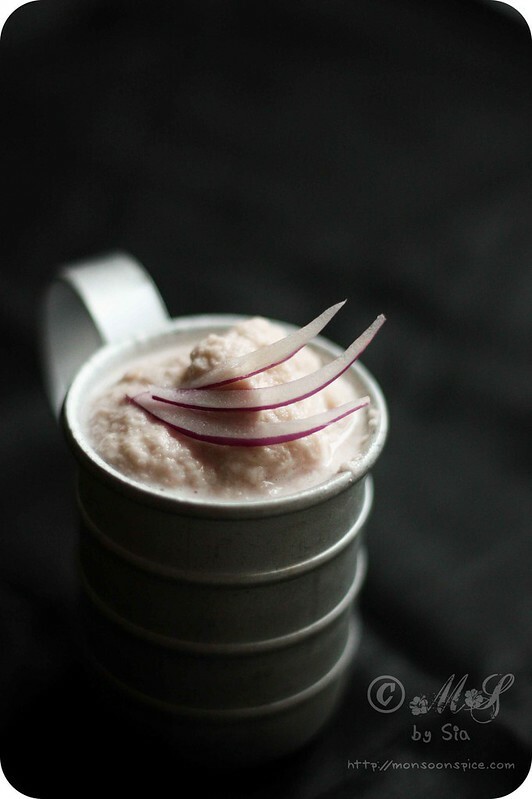 This Onion-Coconut Chutney is mild tasting one. My Amma adds 2-3 green chillies or dry red chillies lightly fried in a teaspoon of oil for few seconds to notch up the heat level! You can also add about ¼ tsp of cumin seeds for different flavour. 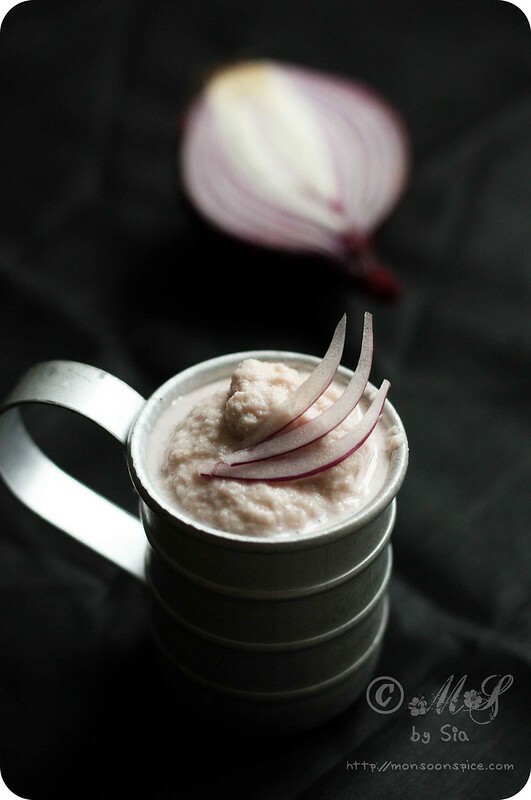 This Onion-Coconut Chutney goes well with any Idli or Dosa and can also be served with plain rice and yogurt. Since we are using raw onion here, the shelf life of this chutney is less than 3 days when stored in refrigerator. This kind of chutney is totally new to me. I'm sure it tastes wonderful! Lovely click and chutney too. do visit my space too. 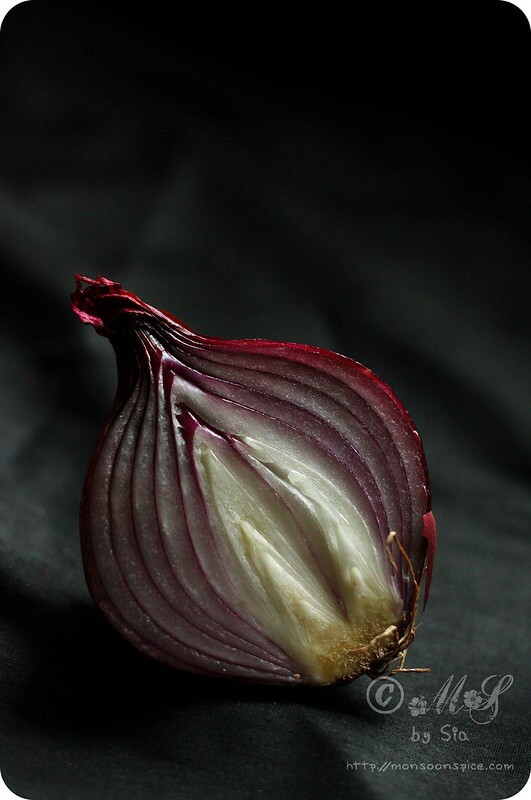 I really admire ur photography skills.The red onion pic is the best. Love the beautiful clicks dear..chutney is delicious..
oh gosh Suppi, you brought back all those sweet memories in one single post of yours . Seriously those were the fearless and fun filled days that our kids or this generation will never ever get to experience alda? I miss it so much myself :( and so much want my boys to experience what we did as kids. Looks yummy!! 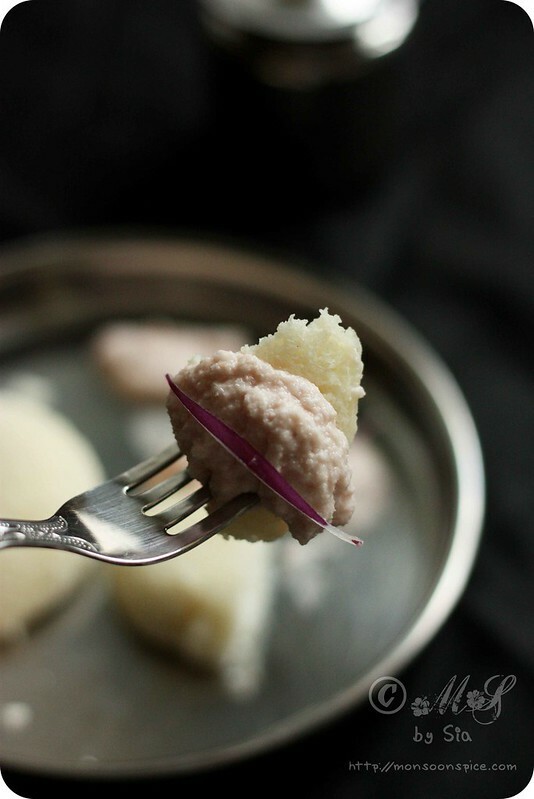 I like to make variations in coconut chutney too! Hi Sia, have hopped over from G+. I am planning to try this over the weekend. I've only ever made the cooked version, this must have a stronger hit, I guess. Love the description of the garden withs its various plants/trees! @Azlin Bloor, welcome to Monsoon Spice! 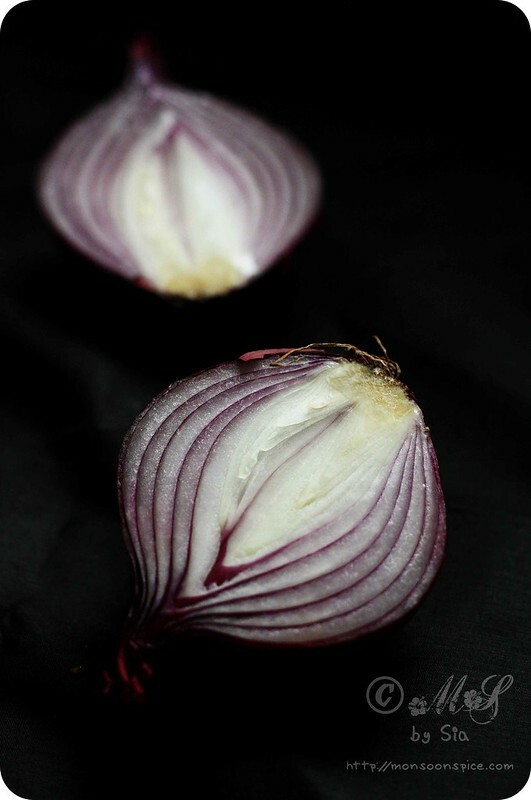 Yes, you will taste the raw onions in this chutney but in a nice way :) Do keep me posted if you get a chance to try it. Nice write up! And yes that chutney was a huge favourite during my growing years and I continue to make it as often as I can. Sia.. your lil stories has the capacity to lighten up a depressed mood. Thanks for making my next half of the day a better one. Liked the chutney too but loved the story.